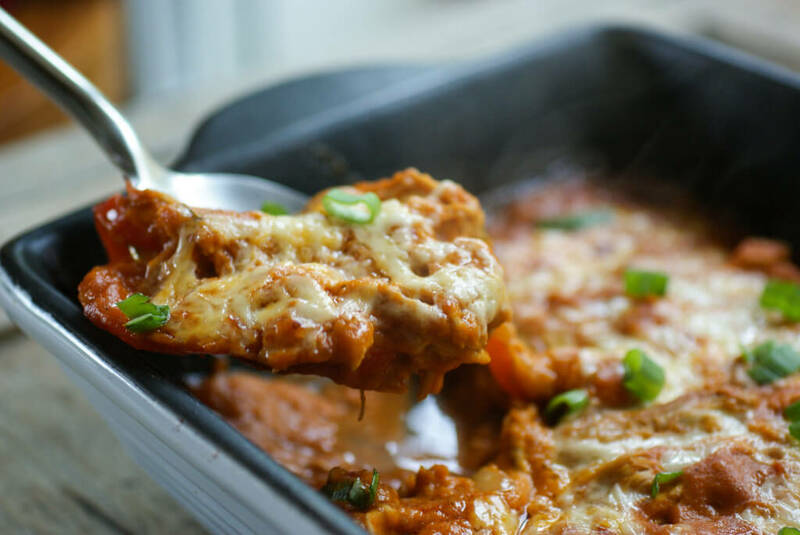 This delicious Chicken Enchilada Casserole dinner recipe is borrowed from one of my favorite paleo sites; Swiss Paleo. Bayne kids tested and approved! Chop the garlic, bell pepper, onion, scallion and chilies. Fry them up in the ghee (butter) until the onions and scallions are translucent. Add the cumin and oregano and cook for about 1 minute. Then add the canned tomatoes, tomato paste, broth and salt. Bring to a boil and then reduce heat and simmer for 15 minutes. Pour into a blender and whiz until smooth. Fry the red bell pepper and onion together in a frying pan with a little bit of ghee until tender. Add in the chopped or shredded cooked chicken. Spoon 1/3 of the sauce into the bottom of a casserole dish. Add a layer of filling. Repeat sauce and filling layers until you run out. Top with grated cheese (optional).